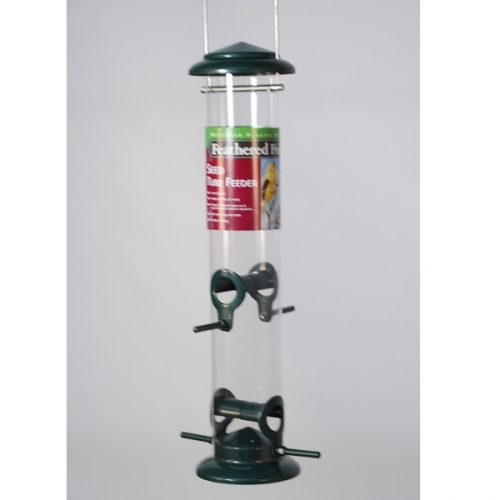 This triple tube feeder features polycarbonate plastic, full looped perches, making it easier for birds to feed and spot predators. Holds 6lbs. of seed. Comes fully assembled. Brushed copper metal caps, ports and bases. Die-cast zinc tops and bottoms. Fully assembled. 4in polycarbonate tube. 8 feeding ports. May be mounted on a 1in pole (no bracket required). Capacity: 5.5 lbs. Plastic coated green wire nugget feeder makes nugget feeding easy. It&#39;s designed specifically for Nuggets Plus. No assembly required. Holds over 2 lbs. seed. 2-1/2in diameter, 8in tube, 2 port mixed seed feeder. Durable polycarbonate tube. Metal cap and base. Fully assembled. Green. 2-1/2in diameter, 15in tube, 6 port Nyjer feeder. Durable polycarbonate tube. Metal cap and base. Fully assembled. Yellow. 2 1/2in diameter, 8in tube, 2 port mixed seed feeder. Durable polycarbonate tube. Metal cap and base. Fully assembled. Red. 2 1/2in diameter, 15in tube, 4 port mixed seed feeder. Durable polycarbonate tube. Metal cap and base. Fully assembled. Red. 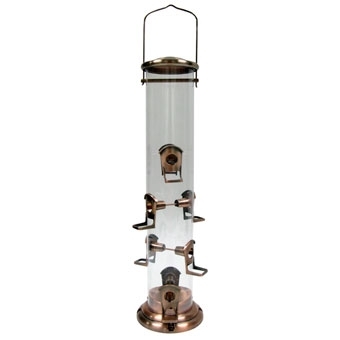 An upscale, upside down finch feeder with beautiful metal bands adorning its feeding tube. 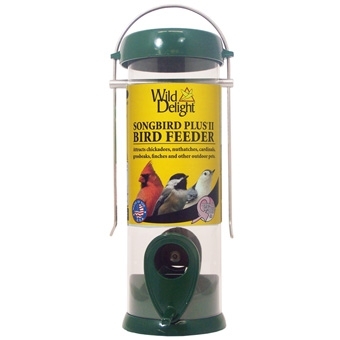 Exclusive 2 in 1 Feeder with 12 feeding ports, can dispense 3 different types of seed at the same time. Fully assembled with seed tray. 4.5 pound seed capacity. Squirrel resistant heavy-duty wire cage with locking metal cap. 12 feeding stations. 8qt Seed capacity (approx. 1lb). Use black oil sunflower, hulled sunflower or sunflower mixes in feeder. Allows observing bird behavior and feeding habits up close. 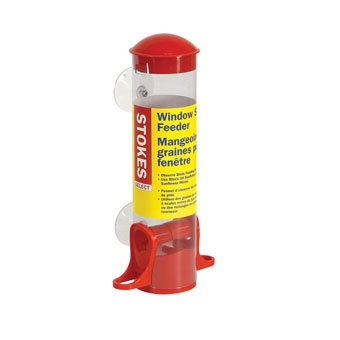 Specially designed with ergonomic perches to offer great comfort to birds while they feed. The roof top design on portals sheds rain to keep seed dry. For long lasting use and beauty, the die cast parts are polyester powder-coated in an attractive, subtle deep green color. The Polycarbonate tube is durable and weather-resistant. 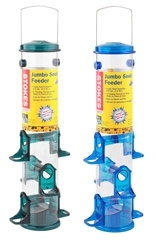 Jumbo Feeder has a large seed capacity of 2.5qts (over 3lbs.). Feeder has 6 portals for many birds to feed at once. New open tube design allows maximum seed capacity and makes filling and cleaning easy. 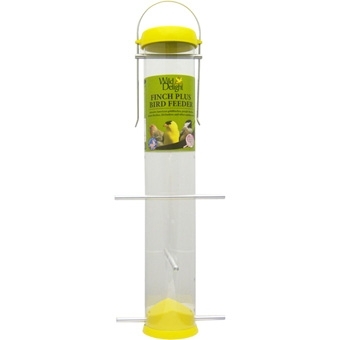 Three feeding holes per perch help with seed flow in this orthinologically correct bird feeder. The roof top design on the portals shed rain to keep the seed dry. For long lasting use and beauty, the die cast parts are polyester powder-coated in an appealing, subtle green color. The polycarbonate tube is durable and weather-resistant. 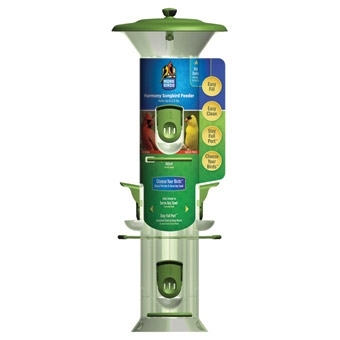 Finch Feeder has a large seed capacity of 2.5qts (over 3lbs.). Feeder has 6 portals for many birds to feed at once. New open tube design allows maximum seed capacity and makes filling and cleaning easy. 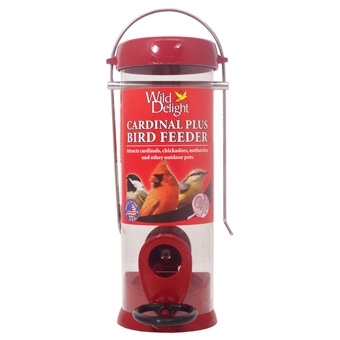 Crossover Feeder includes finch and seed portals to easily convert. Removable catch tray keeps messy seeds from reaching ground. Attract all varieties of birds. Feeder has a large seed capacity of 2.5qts (over 3lbs.). Seed Tube featuring Quick Clean revolutionary removable base. Lifetime guarantee. Made in USA, 4 seed ports. 1-1/4qt capacity. Seed Tube featuring Quick Clean revolutionary removable base. Lifetime guarantee. Made in USA, 6 seed ports. 1-3/4qt. capacity. Nyjer Tube featuring Quick Clean Revolutionary removable base. Lifetime guarantee. Made in USA, 8 feed station. 1-1/4qt capacity. Wide mouth design offers Easy Fill to reduce or eliminate spillage. 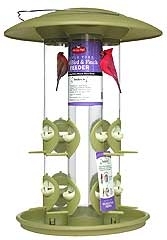 Six feeding stations accommodate Nyjer, sunflower or mixed seed. Allocates seed evenly to all 6 ports. Large rounded perch lets birds stand to the sides or front to better watch for predators while feeding. 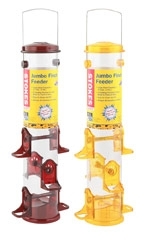 Feeder halves hinge apart to allow for easy cleaning. Holds up to 2.5lbs of seed. 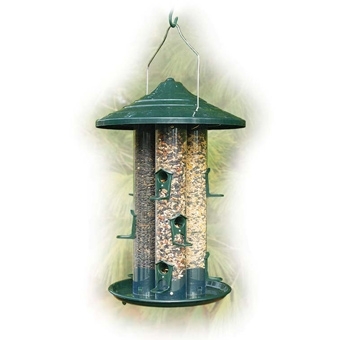 Sunflower or mixed seed feeder holds 2 lb. of seed. Feeder has plastic top and perches. Seed tube feeder attracts many kinds of birds! Six metal seed ports. Holds 1 quart of seed. Polycarbonate tube. Easy to clean and fill. Ready to hang. Roof and base are made of over 90% recycled plastics. Our recycled plastic doesn't absorb water so it won't harbor mold or bacteria. New feature - E-Z clean snap out base. No tools required. Features recycled plastic top, base, recycled metal ports and recycled polycarbonate tined tube. 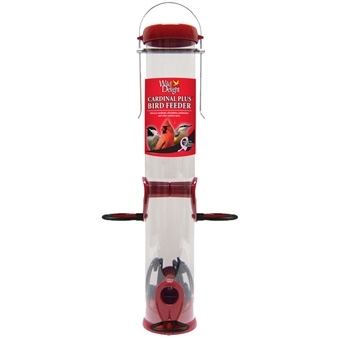 The 2 lb seed capacity tube has 4 ports and the patented base opens easy for cleaning.